Burma, officially the Union of Myanmar, is the largest country by geographical area in mainland Southeast Asia or Indochina. The country is bordered by China on the northeast, Laos on the east, Thailand on the southeast, Bangladesh on the west, India on the northwest and the Bay of Bengal to the southwest with the Andaman Sea. Britain conquered Burma over a period of 62 years (1824-1886) and incorporated it into its Indian Empire. Burma was administered as a province of India until 1937 when it became a separate, self-governing colony; independence from the Commonwealth was attained in 1948. Gen. NE WIN dominated the government from 1962 to 1988, first as military ruler, then as self-appointed president, and later as political kingpin. In September 1988, the military deposed NE WIN and established a new ruling junta. Despite multiparty legislative elections in 1990 that resulted in the main opposition party - the National League for Democracy (NLD) - winning a landslide victory, the junta refused to hand over power. NLD leader and Nobel Peace Prize recipient AUNG SAN SUU KYI, who was under house arrest from 1989 to 1995 and 2000 to 2002, was imprisoned in May 2003 and subsequently transferred to house arrest. After the ruling junta in August 2007 unexpectedly increased fuel prices, tens of thousands of Burmese marched in protest, led by prodemocracy activists and Buddhist monks. In late September 2007, the government brutally suppressed the protests, killing at least 13 people and arresting thousands for participating in the demonstrations. Since then, the regime has continued to raid homes and monasteries and arrest persons suspected of participating in the pro-democracy protests. The junta appointed Labor Minister AUNG KYI in October 2007 as liaison to AUNG SAN SUU KYI, who remains under house arrest and virtually incommunicado with her party and supporters. Burma in early May 2008 was struck by Cyclone Nargis which official estimates claimed left over 80,000 dead and 50,000 injured. Despite this tragedy, the junta proceeded with its May constitutional referendum, the first vote in Burma since 1990, setting the stage for the 2010 parliamentary elections. 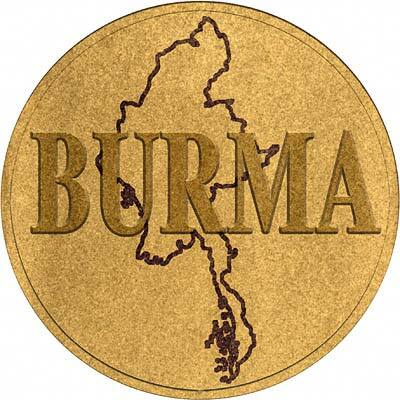 For silver and base metal coins of Burma, please look at our original Chard Coins website. We make an active market in almost all world coins, gold or otherwise, including Burmese gold coins. If you have any of these coins to sell, please contact us, or post them to us for appraisal and offer.